Detail from Tim Bertelink's Artist Impression of the Kelly-Hopkinsville "goblin." Image used under CC BY-SA 4.0 license. 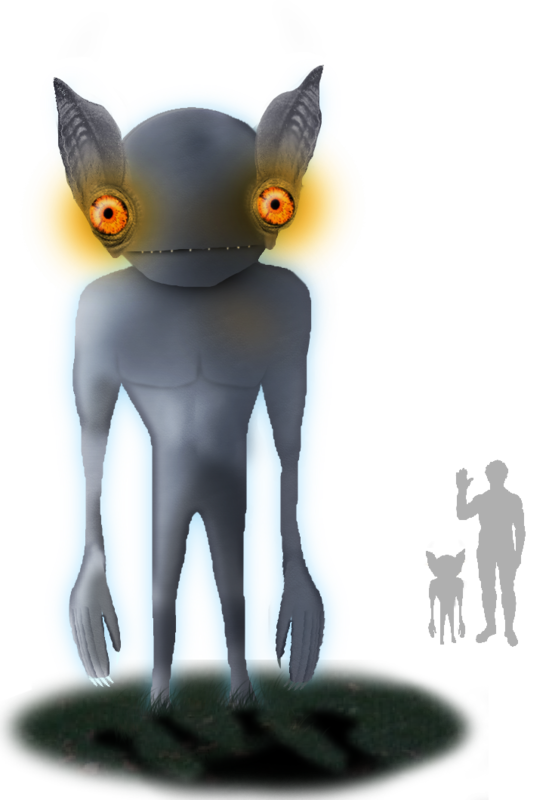 Tim Bertelink's Artist Impression of the Kelly-Hopkinsville "goblin." Image used under CC BY-SA 4.0 license. Copy of Copy of South-facing view of homesite. Treeline in background is gully. Tree in center of picture is said to be the site of the well Billy Ray Taylor was drawing water from when he first saw the object in the woods. 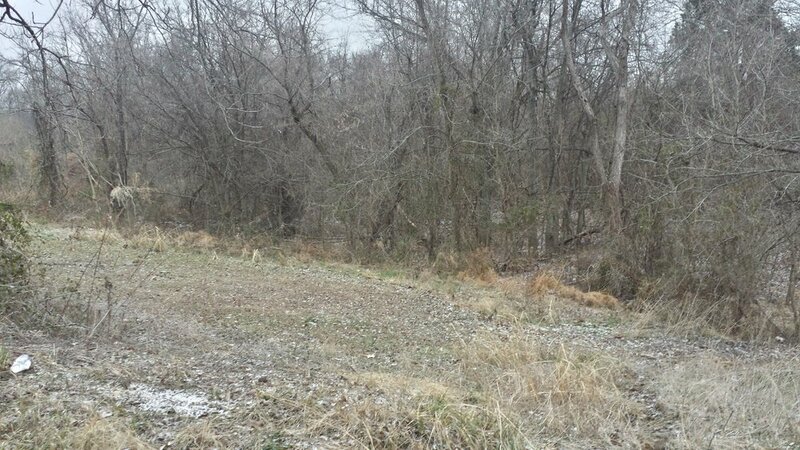 East facing view of gully behind homesite. "In and around the whole area, the house, the fields, that night, there was a weird feeling. It was partly uneasiness, but not entirely. Everyone had it. There were men there that I'd call brave men, men I've been in dangerous situations with. They felt it too. They've told me so." It's easy to dismiss the entire Kelly-Hopkinsville Encounter as the booze-fueled fantasy of a bunch of backward hicks who can't tell the difference between a goblin and an owl, or maybe you think it was an outrageous hoax perpetrated for cash. But before you begin telling people what they saw, or make assumptions based on character or class, just remember: unless you were there, you weren't there. These people didn't ask for this incident to happen to them, and they especially didn't ask for the notoriety or ridicule that followed. What the authorities at the time believed, and what many skeptics agree on in hindsight, is that the Sutton and Taylor families were genuinely terrified of something real, and yet even the most seasoned paranormal researcher can't definitively say by what or by whom. So maybe your educated reasoning doesn't allow for the possibility of otherworldly creatures? Well, that's fine, it's a natural human desire to make sense of the impossibilities of our strange world with rationalizations that we can comfortably live with. But as you do so, keep one more thing in mind: you can spend years or a whole lifetime developing and refining your rationale for disbelief, but it only takes one undeniable, paranormal experience to make you a believer. Use PROMO CODE "Legends50" for a $50 Savings! If you enjoy the subjects we cover on this show and love stories that take you down deep, dark "rabbit holes," check out Tanis, The Black Tapes, and Rabbits podcasts, from The Public Radio Alliance. Subscribe in iTunes/Apple Podcasts or wherever you find wondrous and outstanding shows. "The Owl Whisperer" YouTube video – WARNING: FOWL, er FOUL LANGUAGE! The Owl and the Pussycat are best friends! SONG: Elvis Costello's What's So Funny 'bout Peace, Love and Understanding? 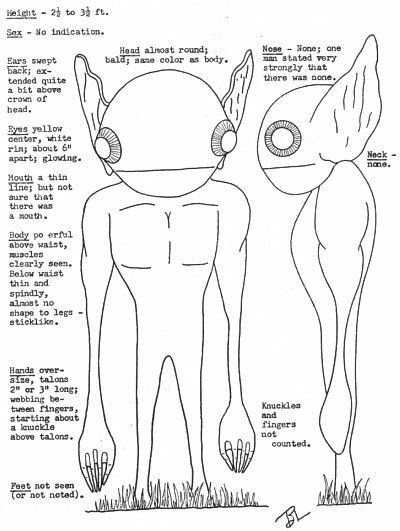 SONG: Genesis – "Keep it Dark"
Sableye Pokémon – based on the Kelly-Hopkinsville "Goblins"
The "Chinese Whispers" game, or as it's known in the US, "The Telephone Game"
Could Kelly's "Little Green Men" return with the coming Total Solar Eclipse? Policy Genius – One unfortunate accident or illness can devastate a family – that's why there's Life Insurance and Health Insurance, and now getting a policy quote has never been quicker or easier. Go to PolicyGenius.com to save up to 40% just by comparing policies and it only takes 5 minutes. Blue Apron – You will love how good it feels, and tastes, to create incredible home cooked meals with Blue Apron! Go to blueapron.com/astonishing to check out this week’s menu and get your first THREE meals FREE, with FREE SHIPPING! Episode 81: The Kelly-Hopkinsville Incident, Part 3. Produced by Scott Philbrook & Forrest Burgess; Audio Editing by Sarah Vorhees; Ryan McCullough Sound Design; Research Assistance by Tess Pfeifle and the astonishing League of Astonishing Researchers, a.k.a. The Astonishing Research Corps, or "A.R.C." for short. Copyright 2017 Astonishing Legends Productions, LLC. All Rights Reserved. Copy of South-facing view of homesite. Treeline in background is gully. "If aliens visit us, the outcome would be much as when Columbus landed in America, which didn't turn out well for the Native Americans." 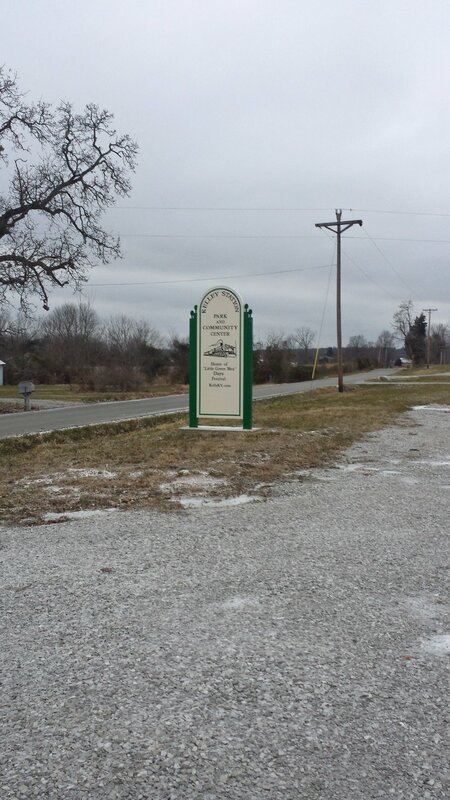 In Part Two of our series on the Kelly-Hopkinsville Encounter, we analyze the elements of the Sutton and Taylor families' story. Is the tale that ended up in the media what actually happened or were certain descriptions exaggerated to make the story more sensational in order to sell newspapers? Perhaps some details were misreported due to anxiety, faulty memories and the phenomenon of the "Telephone Game?" Or was it all a hoax and for what gain? What we find is that the story in its original and accurate telling is so bizarre, any further embellishment would be pointless and believe it or not, that's the story the families stuck to, which only serves to add more mystery to an already mysterious world. Episode 80: The Kelly-Hopkinsville Incident, Part 2. Produced by Scott Philbrook & Forrest Burgess; Audio Editing by Sarah Vorhees; Ryan McCullough Sound Design; Research Assistance by Tess Pfeifle and the astonishing League of Astonishing Researchers, a.k.a. The Astonishing Research Corps, or "A.R.C." for short. Copyright 2017 Astonishing Legends Productions, LLC. All Rights Reserved. South-facing view of homesite. Treeline in background is gully. "I turned my head three different times because I thought maybe my eyes were fooling me. But every time I turned my head back, there he was." 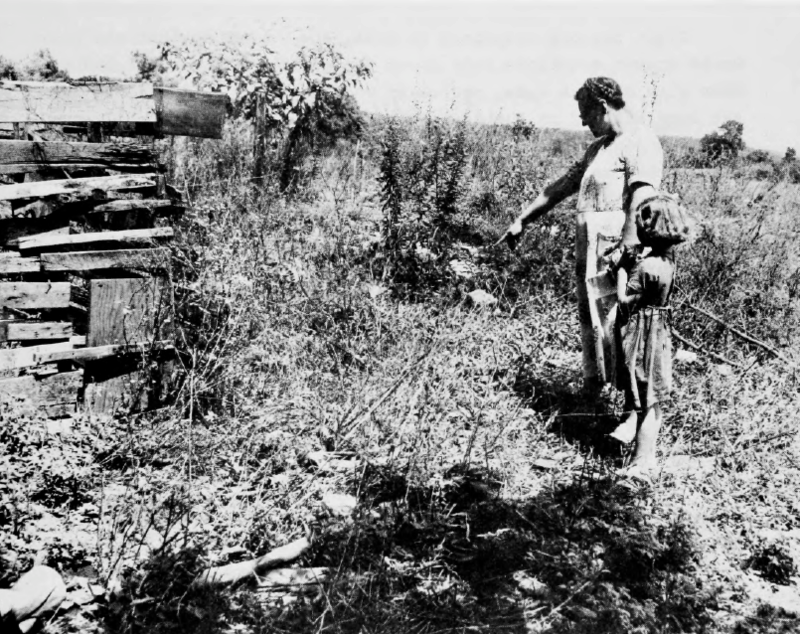 The 1950s was awash with incredible UFO sightings and purported alien encounters, but the Kelly-Hopkinsville Incident remains a highlight for the field of Ufology. The report was significant not only because of the long duration of the event and a large number of witnesses but also because the frightening contact sparked a one-sided gun battle. On the evening of Sunday, August 21, 1955, one of the occupants of the Sutton farmhouse, in the unincorporated area of Kelly north of Hopkinsville, Kentucky, reported seeing a saucer-like craft land a short distance away in a gully to the rear of the property. Moments later, the two families staying there claimed that a number of "strange little men" approached the house and peered through the windows, and one even tugged the hair of Billy Ray Taylor, the man who had first seen the craft land. Understandably bewildered and fearing for their lives, Taylor, and another adult male, "Lucky" Sutton, fired round after round at the unwanted visitors from close range, all to little effect. After about four hours of this awkward alien interaction, the families saw their chance to escape and rushed to police headquarters to get help. The unusually large police response which resulted in a flurry of sensational news reports for years to come would cast this incident as one of the most bizarre and intriguing "Close Encounters of the Third Kind" ever to be included in UFO lore. That's It. Fruit Bars – No preservatives, added sugar, fat or gluten. Kosher, Vegan and Raw-Diet friendly. Just wholesome and delicious fruit and MORE FRUIT. That's It! Go to thatsitfruit.com and enter the promo code LEGENDS at checkout to receive 10% OFF your order! 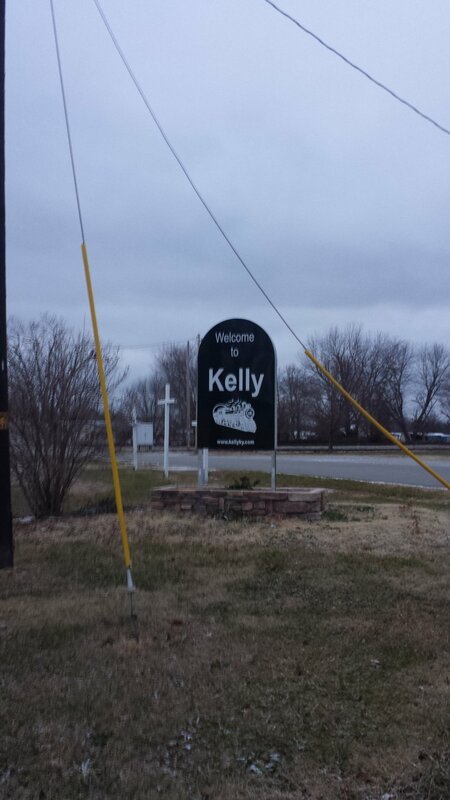 Episode 79: The Kelly-Hopkinsville Incident, Part 1. Produced by Scott Philbrook & Forrest Burgess; Audio Editing by Sarah Vorhees; Ryan McCullough Sound Design; Research Assistance by Tess Pfeifle and the astonishing League of Astonishing Researchers, a.k.a. The Astonishing Research Corps, or "A.R.C." for short. Copyright 2017 Astonishing Legends Productions, LLC. All Rights Reserved.